Congratulations to our first batch of winners. For the month of February, our book is for the older kids. However, younger kids may very well enjoy the familiar Jamaican dialogue and situations. 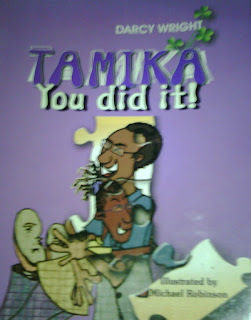 “Tamika you did it” tells the story of a 11 year old Tamika, who is intent on being reunited with her father back in Jamaica. Shortly after birth, Tamika migrated to the United States with her mother. As an only child she was pampered with material gifts. However. Tamika’s longing for her father was not to be pushed aside. So for her twelfth birthday while friends were preparing for her ‘bashment’ birthday party, Tamika tells her mother her greatest gift would be to go to Jamaica and meet her dad. Faced with a prodding daughter, her mothers agrees, on the condition that Tamika can fulfill a most difficult request-that of increasing her attitude to school and improving her grades. Tamika, though usually disruptive in class goes on a quest to be a better student and eventually receive her birthday gift. But this journey is not without challenges. Her disruptive friend always tries to break her concentration at school, she gets into fights and her mother keeps telling her just how bad Jamaica has become and keeps asking if she’s sure she wants to go. So do you think Tamika will improve her grades and work attitude? Will she get to go to Jamaica? Find out more as this book is yours for FREE courtesy of Arawak Publications. I have 3 copies and all you have to do is tell me: what do you think makes YOU a good mother. Winners will be randomly selected…you can comment until the end of February, when we’ll select our winners. And for those who wish to purchase this book, it retails for $600 at Sangster’s bookstores islandwide. I don't have a child for this age range but I think my niece would love this gift. Hmm I think what makes me a great mom is the fact that since becoming a mother I have moved beyond any form of selfishness. My child is now my #1 priority and I think that says a whole lot. I have an award for you, come over and pick it up. My daughter Amira is 10 ans he doesn't like to read, thus, hubby and I try to push her as best we can. We would love to have a copy of this book. I love God first and then my family. I am a great mom because I parent my children as individuals rather than them just being kids. This takes a lot of work and it is ever-changing, but it's important to foster positive self image and outlook in life with a focus on the child's need(s). I think I'm a good mom because I invest TIME with my kids and believe it or not, time is very hard to come by these days. Since have just 3 comments, you all win, please email jamaicanmommies@gmail.com for details on prize collection. Look out for March giveaways.